What could be better than knitting and books, especially in the midst of this dark, cold and snowy weather? Thanks to Ginny and her wonderful blog, Small Things, we can share both and they are just what I need right now to stay sane! I'm sure that I am not alone in feeling the time crunch as Christmas approaches and gifts are needing to be completed to make it into stockings and gift wrap. I was home with a sick child on Monday (which ended up being a precious gift, since I was exhausted myself and really needed the chance to catch my breath after a very busy weekend). I used that time to finish up the fingerless gloves that I was making for Pk's horseback riding instructor. They haven't been a great traveling project as once the thumb gets going, I have 7 needles and it would be much too easy to drop a stitch. 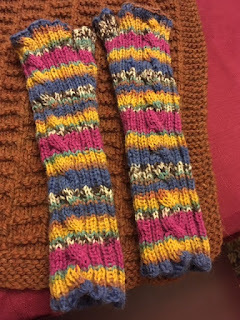 I love that they are made with sock yarn and while you can't really see it in the photos, there is a lovely cable that goes along the top of the hand. I used this pattern and I will definitely be making more pairs for Pk after the Christmas rush is finished since I think they will also be great for her for skating (she is actively involved in figure skating these days). I'm still working on Lb's blanket for his toy fox but I am hoping to have that finished in the next couple of days, as well. In terms of reading, I haven't been getting very far. Every night, I have the greatest intentions of doing some serious reading and within a few pages, I nod off. I am still loving Listening to Madeleine: A Portrait in Many Voices. 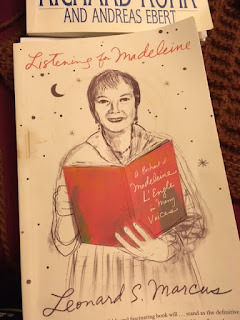 Madeleine L'Engle is, I think, my favourite writer of all time. As a teenager, I read several of her books, I think my favourite was A House like a Lotus and I found myself identifying with her slightly bookish, awkward heroines and the wonderful characters that she creates to help them to learn to be themselves. In the last couple of years, I have fallen in love with her journals and several of her reflections on faith. She does such a great job of blending a love of God and of mystery. I was afraid that I wouldn't like this book as seeing someone through the eyes of those around her can be a great way to discover that one's heroine has lead feet but the more I read, the more I find that M.L. is exactly who I hoped that she would be. I'm still working my way through The Enneagram: A Christian Perspective, which is also good but not as easy going. I am determined to finish Emily Davis by Miss Read this week, too. It's wonderful in the perfect "cozy English village" kind of way.